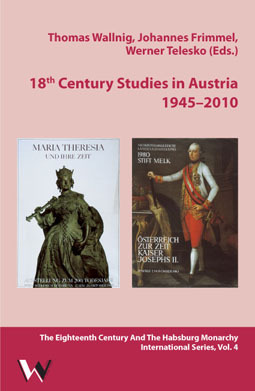 18th Century Studies in Austria, 1945-2010. This volume offers the first interdisciplinary overview of 18th century studies within the Austrian academic landscape after 1945. It contains contributions on the History of Art, Music and Literature as well as on a wide range of historical disciplines. All contributions were written by scholars who actively carry out reseach in the academic field today. The collection documents the long persistence of traditional research paradigms in the post-war decades, while also providing an account of the change, the research on the 18th century has undergone since then. The book can be read as a prehistory and as a documentation of the present state of research. Thus, it is an indispensable reference for any further studies on the Habsburg Monarchy of the 18th century. Der Sammelband dokumentiert sowohl das Beharrungsvermögen traditioneller Forschungsparadigmen in der Nachkriegszeit als auch den Wandel, den die Forschung zum 18. Jahrhundert vollzog. Das Buch kann als Vorgeschichte und Dokumentation des heutigen Stands der Forschung betrachtet werden. In diesem Sinne ist es die unverzichtbare Referenz für künftige Studien zum Thema Habsburgermonarchie im 18. Jahrhundert.